Habitat: Sesame is native to Africa and India. It is widely naturalized in tropical regions of the world. 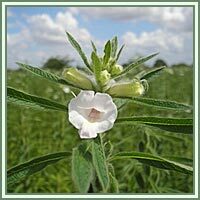 Description: Sesame is an annual plant growing up to 100 cm tall. It has opposite leaves, broad lanceolate. Flowers are large, bell-shaped. They appear from the leaf axils on the lower stem, and gradually appear as the stem grows. Flowers vary in color. In some varieties they are yellow, in others purple or white. The plant is cultivated mainly for its seeds, small and flat ovals with mild, nutlike flavor. Useful components: Iron, magnesium, manganese, copper, calcium, vitamin B1, vitamin E, phytic acid, phytosterols and sesamin. Medicinal use: Sesame seeds have been used as a medicine since antiquity. They are considered to beantioxidant, anticancer, demulcent, emollient and laxative properties. Due to its lignans content, Sesame is very efficient in lowering cholesterol levels. One of its lignan components, sesamin, is proven to protect the liver from oxidative damage. 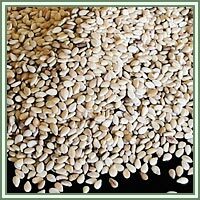 As an excellent source of phytosterols, Sesame seeds are efficient immune enhancer. It is also believed that they can help as prevention against certain forms of cancers. Safety: Sesame seeds could produce an allergic reaction. Some herbs could react with certain medication. It is advisable to consult your doctor/herbalist before consumption of any herb.